1982: "Skyscrapers," Perspecta 18, pp. 134–151. ^ "Master of the Schuylkill – Architect César Pelli". Patriot Harbor Lines. Retrieved September 12, 2016. ^ "A Conversation with Cesar Pelli". New Haven Living. July 2013. Retrieved September 12, 2016. ^ "Cesar Pelli: Connections". National Building Museum. Retrieved September 12, 2016. ^ Benjamin Forgey. "COMSAT Alumni & Retirees Association". COMARA.org. Retrieved 2013-04-21. ^ "2008 Lynn S. Beedle Award Winner". Council on Tall Buildings and Urban Habitat. Retrieved 17 May 2012. ^ "César Pelli: "I avoided a style"". La Gaceta. June 10, 2012. Retrieved September 12, 2016. ^ Marcelo Gardinetti (June 2012). 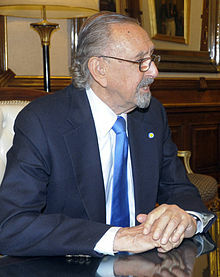 "César Pelli Tucuman". Technne. Retrieved September 12, 2016. ^ Charles E. Gagit, Jr. (June 1, 2015). The Groundbreakers: Architects in American History Their Places and Times. Transaction Publishers. ^ "Cesar Pelli gives convocation address at University of Illinois". Pelli Clarke Pelli Architects. May 17, 2014. Retrieved September 12, 2016. ^ Paola Singer (May 10, 2016). "César Pelli and His Nonchalant Architecture". Surface Magazine. Retrieved September 12, 2016. ^ Nicholas Von Hoffman (February 28, 2005). "Cesar Pelli Architecture and Design". Architectural Digest. Retrieved September 12, 2016. ^ Interview with Cesar Pelli by Michael J. Crosbie, New Haven, CT, March 8, 2016. ^ "Early Cesar Pelli Building Threatened with Demolition". Preservation Online. National Trust. June 21, 2005. Archived from the original on 2006-05-03. ^ Michael J. Crosbie. "Introduction: A Conversation with Cesar Pelli." Cesar Pelli: Selected and Current Works. Mulgrave: Images Publishing Group, 1993. ^ "UMD to honor Weber Music Hall architect at commencement May 13". Budgeteer News. April 30, 2004. Retrieved September 12, 2016. ^ Connecticut Architecture Foundation . Retrieved November 30, 2016. ^ Michael J. Crosbie. Pelli Clarke Pelli Architects. Basel: Birkhäuser Verlag, 2013. ^ "Petronas Twin Towers". Culture Now. Retrieved September 12, 2016. ^ Linda Hales (November 27, 2004). "The Spirit Behind the Aga Khan Awards". Washington Post. Retrieved September 12, 2016. ^ "Pacific Design Center". Los Angeles Conservancy. Retrieved September 12, 2016. ^ "University awards 3,117 degrees at Commencement". Yale Daily News. Archived from the original on 2008-07-27. ^ "César Pelli's exhibition at Mendoza". Universidad De Mendoza. Retrieved September 12, 2016. Wikimedia Commons has media related to César Pelli.